The quickest and easiest way to find agendas and minutes is to view our Council Meetings Calendar where you will find all papers associated with each meeting linked to the calendar entry. All agendas are entered on this website at least 3 clear days before a Council meeting. Agenda items for councillors to consider must be advised to the Parish Clerk in writing 7 clear days before the day of the meeting. 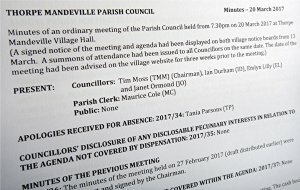 Meeting notices with agendas are also normally provided on the two notice boards in the village at least 3 clear days before a meeting. Public participation at meetings is at the discretion of the Council.